Like everyone the space between holiday celebrations and New Years brings a moment to reflect with gratitude on what transpired, what was accomplished and what lies ahead in the world of evolving human consciousness in business. A glance at the kinds of decisions made, the division and polarization that conceals areas where business are transforming, albeit often reluctantly, and leaders who are buried beneath the ranks of management shine light on the path. The Inspirational Insights podcast that I started in October of 2016 benefited from insights emanating from agile, leadership, global challenges, complexity, the nature of wicked problems, self-management, business sustainability, human potential, organizational design and decision-making. Quite a mixed bag I know but it reflects how my mind works and how serendipitous events present interesting people doing interesting things to help restore human to human connection in all contexts while benefiting customers, society and the wider world. I arranged these by theme and did not include the ones I did which cover global challenges, wicked problems and expanding human consciousness through homelessness/adversity. Increasing Quality Skills and Collaboration Through Mob Programming- The Clearlink Experience (recorded when I was in Boston delivering a workshop at the Mob Programming Conference. With Torrey Powell, Nate Wixom and Charlie King of Clearlink. Making the shift from the expensive, slow to respond traditional centralized decision-making to an approach that provides more agility also requires greater awareness, consciousness skills and depth perception plus vision. Yes, it is me. Working to contribute to bringing a shift in perspective and in strategy for how we collectively inspire and solve complex issues globally. This is where I met impACT, Saji Prelis and Battle4Humanity coming up next. Something I care about a LOT and see much potential in.. the intersection between hope, youth and creative initiative that shows up in these two episodes. 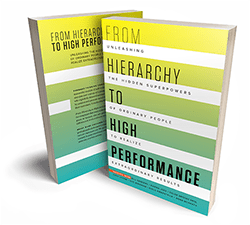 With co-authors Doug Kirkpatrick, Josh Levine, Bill Sanders, Ozlem Brooke Erol, Anna McGrath, Sue Bingham we published From Hierarchy to High Performance in August, 2018. Available on Amazon, Barnes & Noble. Naturally. It’s been a great year of speaking and workshopping in Boston, Vancouver, and Stockholm. Personally, I’ve had the opportunity to remember how comfortable I am with thorny issues that run from the grassroots to surface as a global risk/challenge. I’ve been reminded of the limits of linear thinking in solving those wicked problems which inspired me to refocus on my tech-based solutions to replacing stigma with empathy and for reigniting and expanding self-efficacy in a world where unethical decisions are rewarded with fear and relinquishing control. That leads me to 2019. If 2018 was the year of sharpening contrast between humans stepping up or resorting to violence then 2019 is a defining year for business and true leaders to step forward and make the leap into a deeper level of human potential. One that uses adversity to advantage. I hinted at that in my two episodes on 9 Years of Homelessness and Sticking True to Purpose on the podcast. The blog and podcast went on hiatus while I filled out more spreadsheets than my brain can handle in an effort to secure pre-seed funding for one out of two tech prototypes. Going forward I commit to more regular communication. Wishing each and every reader the very best for 2019. It is time for us all to step forward and stand for ethical, caring connection to all people. Civilization depends on it. So does life on our planet. Business leadership is critically important to recognize and accept responsibility for doing things differently, seeing reality through diverse lenses in order to make better decisions and realize profit for all.